We all love our smartphones. Over the course of the past decade or so, they’ve become an essential means of communication for almost all of us. In spite of the undeniable efficiency, and necessity of their use, the systems we’ve become accustomed to haven’t been without some downsides. First and foremost, texting has continued to be a major area of frustration, leading to a host of innovative fixes, namely auto-correct features, now a core component of most devices. While sending text messages might have come a long way since the development of the smartphone, few would doubt that there’s still work to be done. It’s for that reason that San Francisco based startup Fleksy feels it can be an industry leader in mobile communication. Founded in 2011 by entrepreneurs Kostas Eleftheriou, and Ioannis Verdelis, the system uses predictive text technology to enable its users to create messages, even in cases where they’ve typed every word incorrectly. The system will produce a number of alternatives to a misspelled word, allowing its user to select the correct one. The writer can even text without using the keyboard itself, simply pressing buttons on the message face, with potential words being produced at the same time. A logical first question about the functionality of the platform would be how fast it allows its users to correct potential errors, and get their message out. 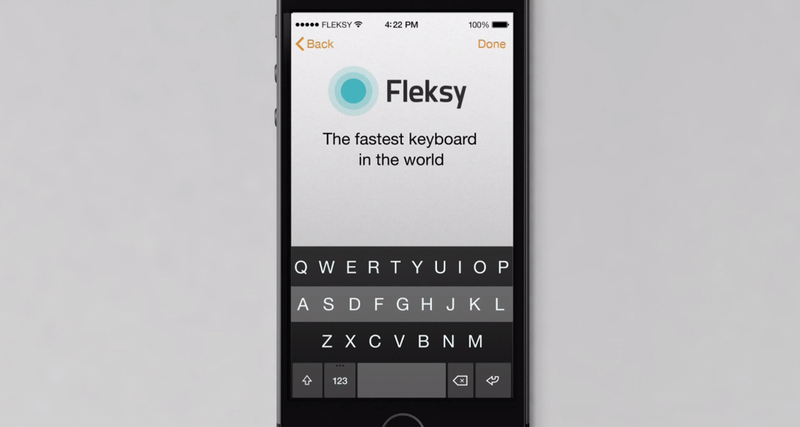 After all, typical auto-correct software isn’t prone to mistakes (often resulting in awkward messages being sent), but Fleksy’s system seems to save time as well as effort, even winning a world record for fastest typing on a smartphone. The disruptive nature of the system has been well received by angel investors as well, with the company having amassed nearly $6 million in funding, including $2 million alone as recently as October. Given the potential for incorporation into new mobile phones this creates (at the moment Fleksy is available as an independent app), it’s easy to understand why the cash flow is steadily increasing. While the positive response from investors might be indicative of things to come, it’s always important to see how consumer markets respond to new technologies such as these. Especially in cases where they are changing such a fundamental part of our lives. A quick look onto the Google Play shop is enough to notice Fleksy has been listed as one of the ‘Best New Apps’ available at the moment. No small feat in and of itself. Nor is the fact that the app has already been downloaded over 100,000 times, including 15,000 reviews with an overall rating of 4.4 out of 5 stars. Fleksy has hit on what people in the startup world call a “migraine” issue, meaning a need for improvement so significant that consumers will respond in an overwhelmingly favorable manner. If the company can keep up this rate of growth, and continue bringing in valuable funding, there’s no reason to believe it won’t be able to significantly expand its user base.